I had been wanting to try this for ages and was prompted by a lovely page in the new Cherry Menloves, Handmade Home book, which is lovely by the way. 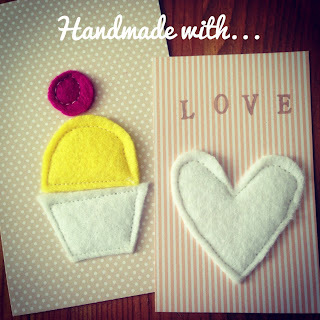 I had some lovely card and cut the shapes out of felt. Using the sewing machine I carefully sewed them just in from the edge of the shapes to secure them in place ! I was really chuffed with the outcome that I have stuck them on to some cards to sell at a craft fair I will be doing later in the year ! If you try these yourself I'd love to see them ! Your blog is gorgeous! I like this post. I will try to do these felted cards!! Really Lovely Review - Girls' Night In.